When you raise your own meat, your attitude towards buying it naturally changes. It's harder to justify spending money on chicken or pork if you already have several hundred pounds of grass fed lamb and black Angus beef sitting in your freezers. And then there's the wild venison our hunter friends supply us with each year, too. Buying somebody else's meat has become a special treat. Since lamb chops and sirloin steaks are everyday fare for us (you'll find links to my favorite lamb recipes here), roasting one of the ten big pastured chickens we order and pick up at the farm each year always turns dinner into a celebration. Splurging on Volpi Red Wine Italian Salami during trips to St. Louis when we already have 40 or 50 frozen packages of our own custom made beef bolonga, salami, and pepperoni waiting to be eaten at home is an infrequent guilty pleasure. Grilled bratwurst and sauerkraut night is a big deal around here, and we get very excited over chicken salad sandwiches. So when Coleman Natural Foods offered me a couple of free packages of their Hans All Natural chicken sausages—which contain no antibiotics, added hormones, preservatives, nitrates, nitrites, or MSG—I naturally said yes. I also started poking around their website, and learned that this company, which has been around since 1875, is doing some really great things. Coleman offers a complete line of natural and organic pork, chicken, lamb, and prepared foods made with our pioneering protocols: raised with no antibiotics, no added hormones or preservatives EVER, and always 100% vegetarian fed. We work exclusively with small family farms throughout the country that share this conviction to provide American families with premium natural and organic meat, poultry, and prepared foods. We allow our animals to grow at their natural pace, with open air access in a comfortable, reduced-stress environment. Coleman's passion for natural and organic extends to the ecosystem, focusing on sustainable land, water, and soil conservation for future generations. You can read more about Coleman Natural, including where and how their chickens are raised, on their Frequently Asked Questions page. They also offer several all natural lunch foods for schools, including hamburgers, uncured beef hot dogs, breaded chicken breast nuggets, and deli sliced oven roasted turkey breast. You'll find ideas and help on how you can get natural foods into your child's lunchroom here and here. Schools currently serving Coleman Natural are listed here. I wasn't thrilled to learn that their chickens are fed a diet of corn and soy, as I don't think these are the best choices—for either the animals, the consumers, or the environment—especially since nearly all non-organic corn (85%) and soy (91%) grown in the U.S. is now genetically modified (GMO). Many people, including myself, believe GMO foods to be unhealthy and very dangerous, and they also threaten and ruin organically grown corn and soy. Unfortunately, feed options for farmers in this country are currently very limited. (Certified organic meat comes animals who have not been fed any GMOs.) It's obvious, though, that all Coleman Natural animals are raised in a sustainable, healthy manner that is far better than that of giant factory farms, where conditions are are often horrid and inhumane. When I picked out chicken sausages with roasted artichokes and black olives, I was thinking about tossing them in pasta with some marinated artichoke hearts, black olives, and freshly grated Pecorino Romano. I decided I should taste a sausage first before launching into my recipe, so I sliced one up, browned the slices in a pan (they're already fully cooked), and laid them over an impromptu salad of arugula, volunteer cherry tomatoes from the garden (my only tomatoes this year! 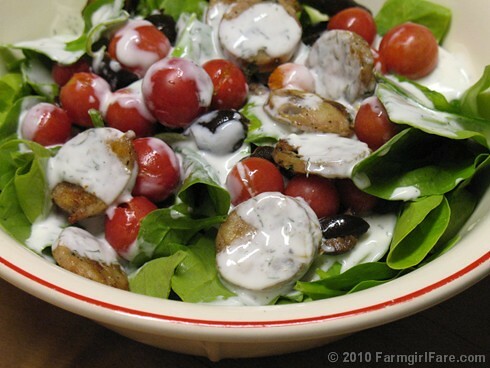 ), olives, Romano, and some of my quick and easy, relatively lowfat homemade buttermilk ranch dressing. And for the next three nights, I ate each of the other sausages the same way. I did share the package of organic chicken bratwurst with Joe, which he grilled. Neither of us cared for the overpowering spice flavor—I think from the cardomom—but I'm sure some people love it. Coleman's Hans All Natural Chicken Sausages are available exclusively at Whole Foods. Other Coleman products can be found at Costco, Trader Joe's, and many other stores. The fourth time I made this quick and healthy salad I used fresh organic baby spinach, and it was really good. A combination of arugula and spinach would be nice. One night I added a handful of canned organic garbanzo beans (a bargain pantry staple I purchase by the case) for extra flavor, fiber, and protein. There are plenty of other things you could put in this salad, such as chunks of sweet red pepper (one of my favorites to grow and eat is Aconcagua), some shredded carrot and purple cabbage, or a few sliced radishes. I would have tossed in a few chopped marinated artichoke hearts if I'd had some. Heat a drizzle of olive oil frying pan over medium heat. Slice the sausage and add it to the pan. Cook until browned and sizzling, then turn the slices over and brown the other sides. 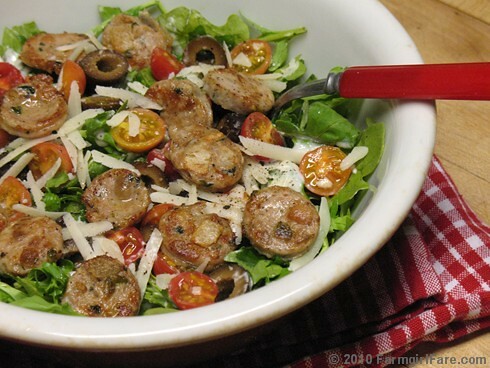 Meanwhile, combine the other ingredients in your favorite salad bowl, top with the warm sausage slices, and dig in. What else do I like to do with arugula? © 2010 FarmgirlFare.com, the all natural foodie farm blog where we go organic whenever we can and are firmly against GMOs, yet we still seem to have developed an unnaturally large amount of cute. Oh yes! This is my kind of salad! Just saved the recipe, although I'll have to get tomatoes at Costco, sigh. Or, try roasting hunks (400 degrees for about 30 minutes) of the sausage with chunks of new red potatoes drizzled with EVOO, chopped fresh garlic, and chopped fresh rosemary. When potatoes and sausage have cooked through, toss with chopped raw, fresh arugula or spinach, or tat soi, or bok choy, (you get the idea), the heat of the potatoes and sausage wilts the greens, no further cooking needed. You can also add onion and/or green/red/anaheim peppers to the roasting mixture. Add a salad or sliced tomatoes and a nice glass of chardonnay and try to keep me from the table! We're lucky enough to still have a real butcher in the Small City that makes their own sausages. Whenever I get a chance, I stock up, especially on kielbasa. Kielbasa from the freezer and a jar of the sauerkraut or German red cabbage I can in the fall is as close as I get to convenience food. Why do companies keep harping on vegetarian feed for chickens? And why do consumers persist in believing that all the animals we eat must be herbivores and therefore better off with a vegetarian diet? It bugs me. That's a beautiful and tasty lookin salad. Chicken sausage, huh. We definitely have similar taste in food. I'm really looking forward to trying your two arugula salads I linked to - along with a couple of others you've posted, too! Oh my gosh, that sounds so good! That is definitely my kind of meal. Thank you! It's funny, too, because just the other day I bookmarked this recipe from Martha Stewart's Everyday Food for Roasted Chicken Sausage and Potatoes. I thought it sounded really good - until I read your trumped up version! As for the big deal about giving chickens 100% vegetarian feed - I think part of it is simply a carryover from the (good) hype over feeding other meat animals a 100% vegetarian diet. Chickens can safely eat meat - in fact, they love it (bugs are meat! ), and you know I feed my chickens all kinds of stuff, from meat scraps and dairy products to even pizza. The big problems arise when you feed meat or animal products to ruminants (like cows and sheep), because their systems are NOT set up to digest meat products. For example, mad cow disease (talk about a big scary problem) was caused by cattle being fed animal products. What's really sad is that there is at least one very well known, huge feed company that is still (or was as of just a few years ago when I was told this firsthand information) selling cattle feed that contains animal products. Our organic fertilizer supplier, who keeps up on all of this scary stuff, was telling me about how these cows were being fed this special food that was full of animal fat. Sure, it caused them to gain weight extra fast (which is all many commercial producers want to do, because the more the animals grow, the more money you make - and the faster they gain, the sooner you make it), but it was also killing them. And when they cut open the insides of the cows, their stomachs were literally lined with a thick layer of grease - I want to say it was like an inch or two thick. That is just so wrong, not to mention disgusting and sad. Anyway, I'm glad that some of this kind of information has gotten out into the public and that conscious producers are going out of their way to use 100% vegetarian feed (although I was shocked to learn about what is still going on.) And like I said, I think what may be partly happening is that it's just carrying over to chickens. People are associating any food animal being fed a vegetarian diet as safe. I know just from things I've posted here about the laying hens we raise, that many people have no idea chickens can, do, and probably should eat animal protein. When allowed to forage on their own, they spend all day looking for bugs. But if you're raising chickens in a confined space (even if it's 'free range' with access to outdoors), in order to feed them meat, you would have to buy some sort of available feed - and what would that be? Most likely, something that's made of meat byproducts, like nearly all dry cat and dog foods are, which isn't a very pleasant choice. And you definitely don't want chickens being fed chicken by products. I just wish there were more readily available grain options for chickens (and other livestock) besides corn and soy. We avoid feeding both here on the farm, and it's not easy - or cheap. But we have such a small operation, at least it's doable for us. Thanks! The salad really was good - if you couldn't tell by my four night repeat of it, LOL. I'm usually a pork and beef sausage kind of girl, but the chicken sausage had a really nice flavor. We raise pastured chickens and your picture makes me want to learn to make chicken sausage. Delicious! Your salad looks delish -- I had to laugh because with our variable New England summers I have learned to hedge my bets and always grow some cherry tomatoes along with my larger favorites, because some years -- too cold and wet or too hot and dry -- they are the only plants to produce. It's not really summer until you have that first bacon-and-tomato sandwich with tomatoes straight from the garden! I just whipped this up for lunch, and what a treat! Chicken sausage is on sale at our natural food grocery, and I'll be going back for more so we can have this again. It's my favorite new recipe of yours!